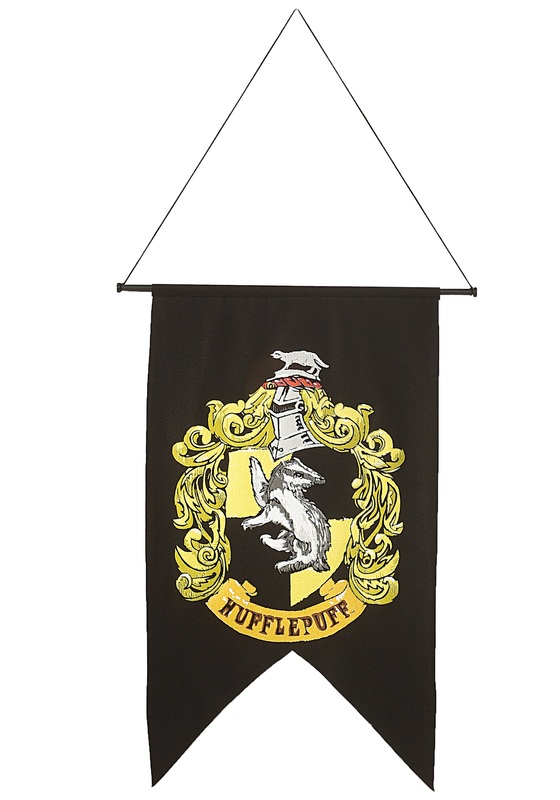 Black banner measures 20" x 30"
The namesake house of Helga Hufflepuff, one of the four founders of Hogwarts School, Hufflepuffs value hard work, patience, loyalty, and fair play. Their house animal, the badger, symbolizes the Hufflepuff's traditional hallmarks of outstanding work ethic and constancy, and their cheerful house colors of bee-like yellow and black signify their friendly and helpful natures. But don't let all that niceness fool you: Contrary to popular opinion, Hufflepuffs aren't dimwits or duffers. In fact, some of the most amazing brains in the wizarding world have come from Hufflepuff, not the least being Newt Scamander, author of Fantastic Beasts and Where to Find Them! Whether you're looking to complete your own Hufflepuff Common Room or are throwing a Harry Potter themed party (don't forget the butterbeer! ), this Hufflepuff banner is a great choice and will add a little cheer to any solid or revolving wall. Collect all of our Harry Potter banners from each of the houses of Hogwarts!